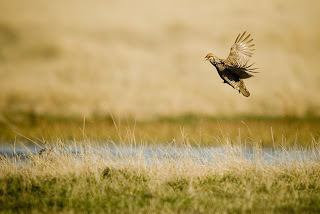 It's prairie chicken mating season again and I spent several hours in a blind on the Fort Pierre National Grasslands watching the show this morning. 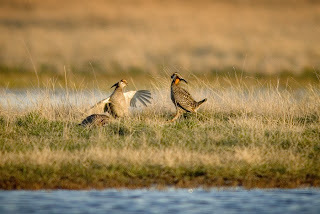 Male prairie chickens perform elaborate dances, hops and struts to impress the females and also engage in short bouts of warfare. This year's batch of birds was a bit far away from the blind for really good photography. These shots are cropped from images made with a 600mm lens. 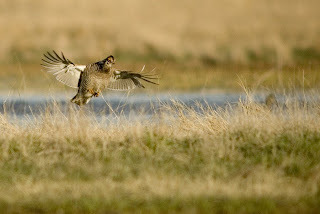 The best way to observe the mating rituals is to reserve a blind from the U.S. Forest Service office in Fort Pierre. More detailed information is in my earlier posts on the subject here. This direct link to the Forest Service will give you contact information for the blind reservations.